December--It doesn't get much better than this! 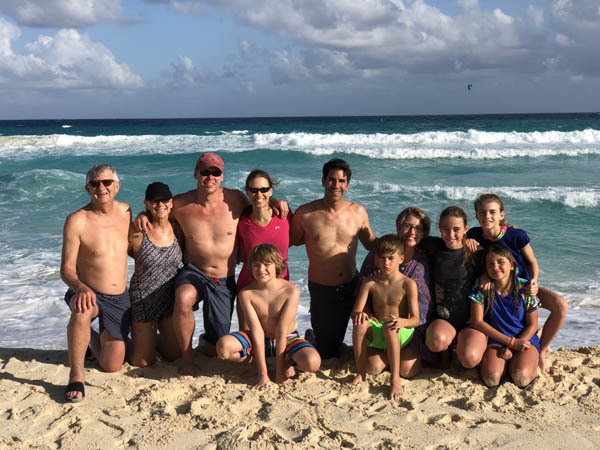 Our kids and grandkids met up with us in Cancun to celebrate our 50th wedding anniversary and ring in the New Year together. 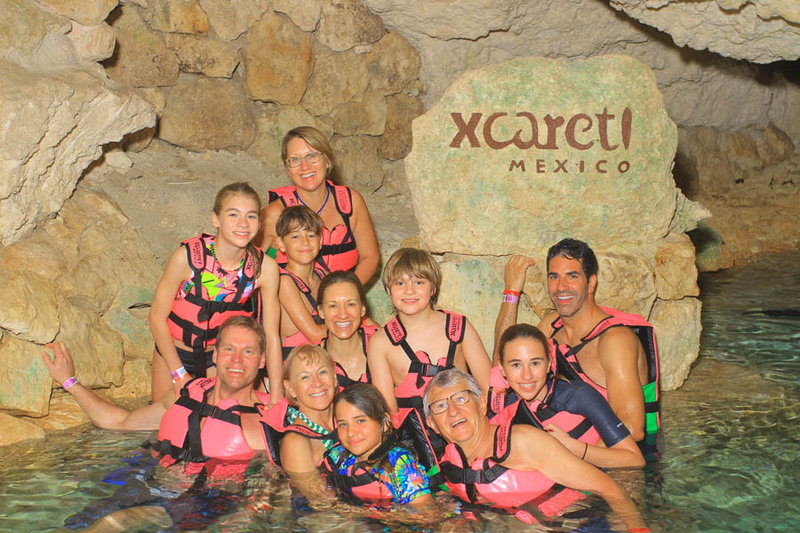 Here we are swimming in an underground river at the XCaret eco-tourism park in the Riviera Maya along the Caribbean coast of Mexico. It would be one of many highlights on our seven-day adventure together. 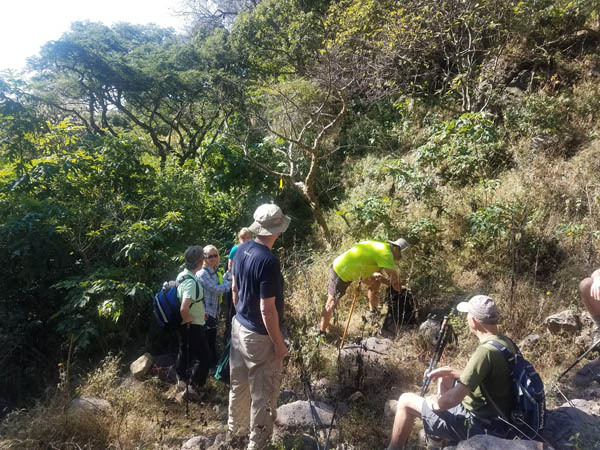 Glorine took up hiking the Sierra Madre mountains with a group of dedicated hikers. Unfortunately, her hiking boots were not broken in and the end result was a lost big toenail. Maybe next season? 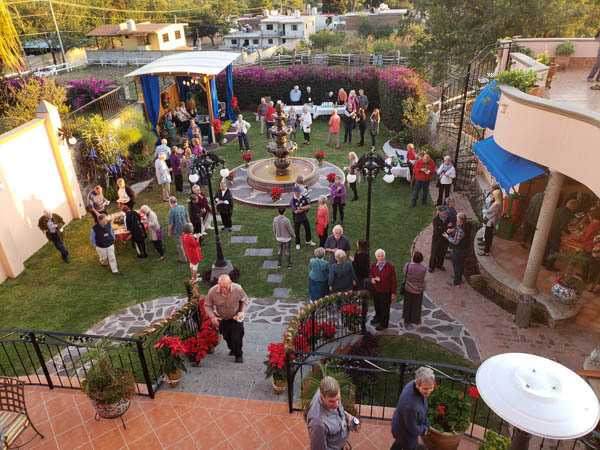 There is no shortage of holiday activities to attend in Ajijic. Here the Los Cantantes Los Lago, a local singing group performed A Jazzy Christmas, along with a children's choir from San Juan Cosala. Game night is back in full swing with five couples playing Hand and Foot. We rotate from house to house with the host couple preparing the main dish, and the rest potluck. 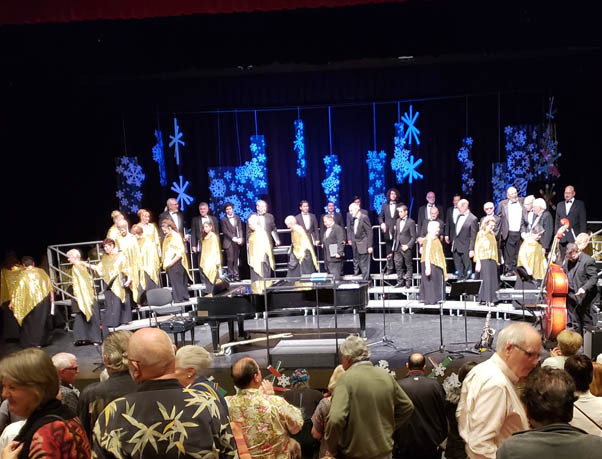 The Christmas 'Behind the Walls Home Tour' was the best ever. Four couples open their magnificent homes to the public. 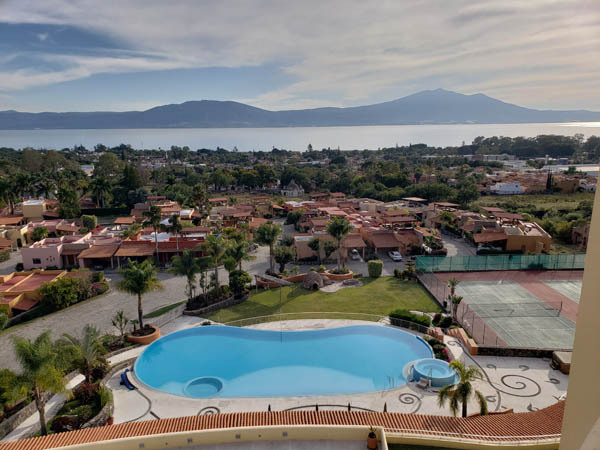 This awesome home overlooked Ajijic and Lake Chapala. 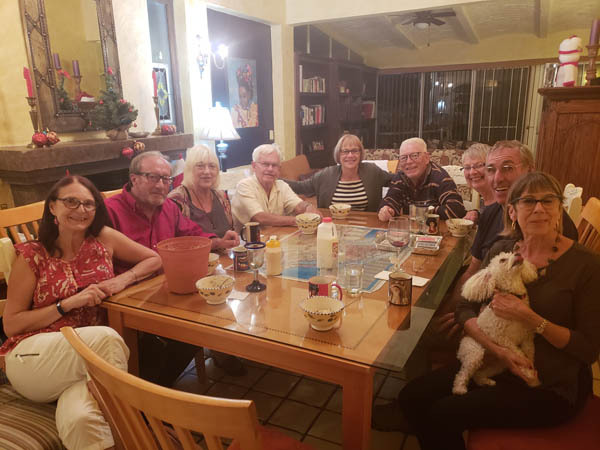 The last home on the tour hosts a Christmas Social with munchies and wine. On the right is a one-bedroom casita that rents for $100 per night--and comes with views to die for. The Spotlight Club is a new club featuring different acts each week. 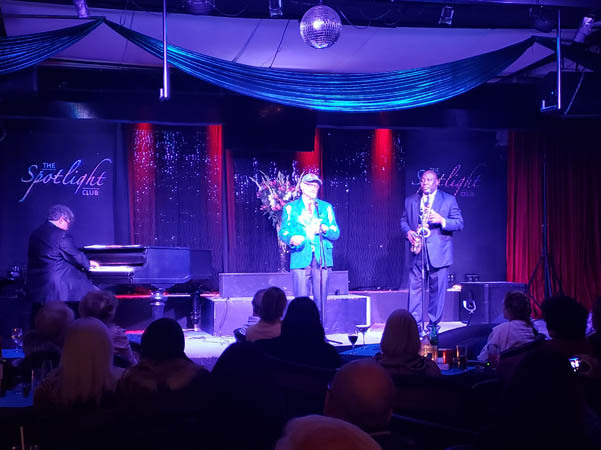 We enjoyed listening to music by the Gabriel Hernandez Trio featuring Saxophonist Alfred Thompson, winner of two Grammy Awards. 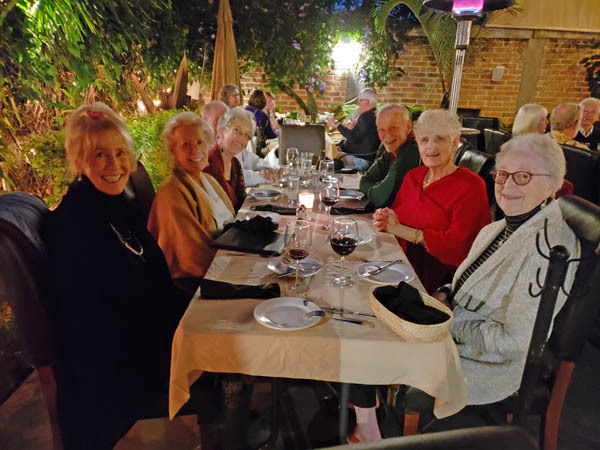 The Lake Chapala Society hosted its annual holiday party for board and committee members, which we got invited to this year. 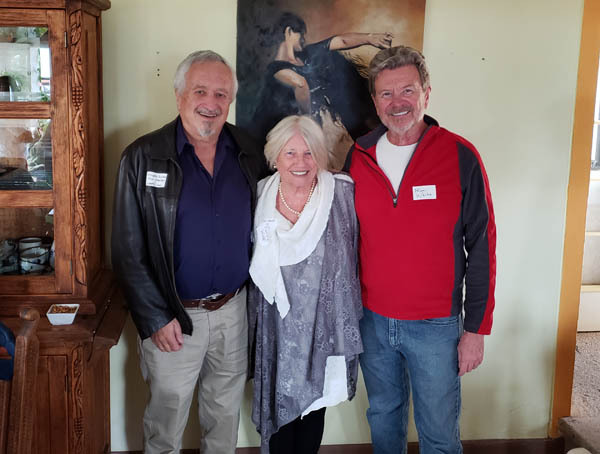 Here are the three most recent presidents of the Society. 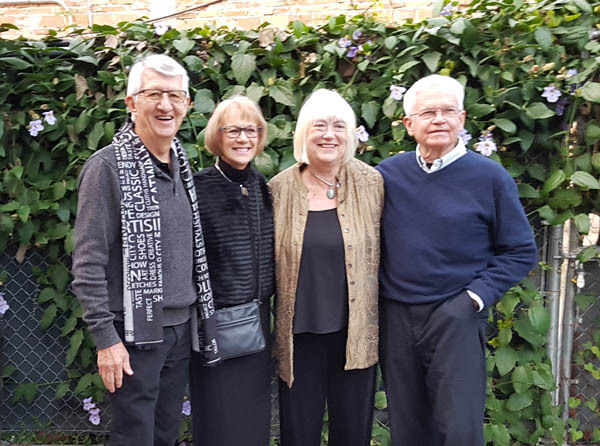 We celebrated our 50th wedding anniversary along with friends Chuck and Jean--same day, same month, same year. 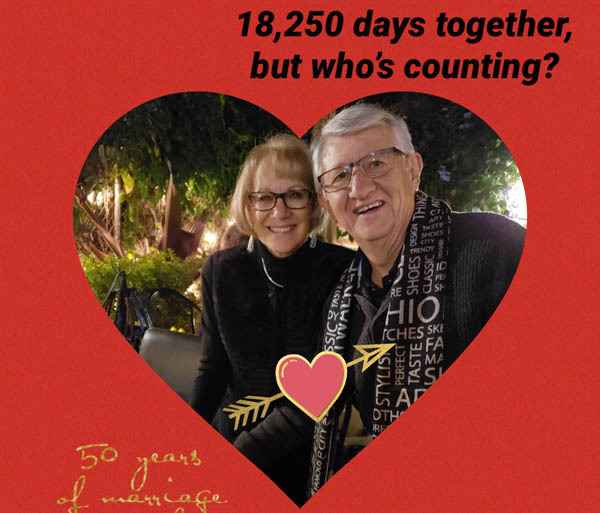 We met them shortly after our 39th wedding anniversary back in 2007. Friends Lil, Norm, Quinton, Rose, Maureen (our maid of honor), Wayne, Jean and Ron joined in on the celebration. 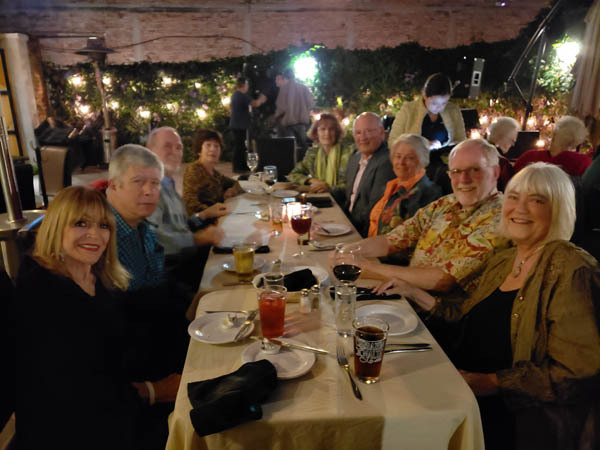 Michelle, Glades, Maureen, Hans, Chris, Barbara and Carol also join us at Adelita's Bar and Grill with cocktails, dinner and live music. No Polkas though!! 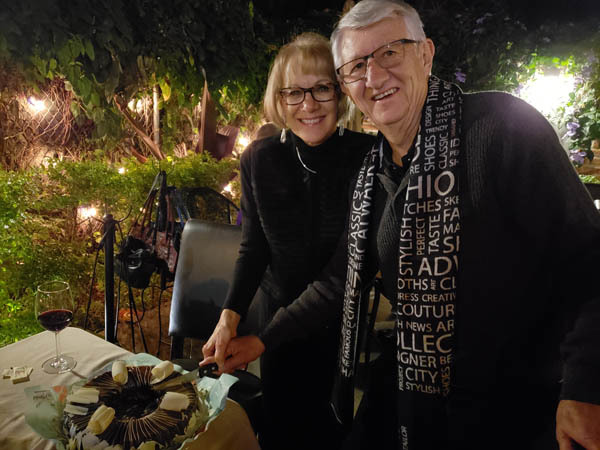 We cut the traditional anniversary cake and had enough to share with the band and our waiters. 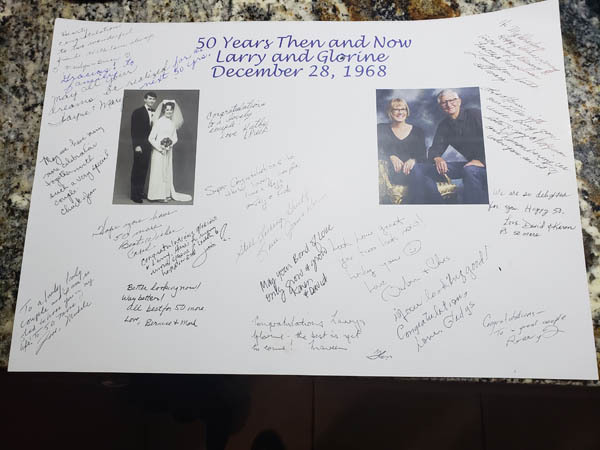 Glorine made up a huge card (for both us and Chuck and Jean) with pictures of us then and now for our guests to sign. 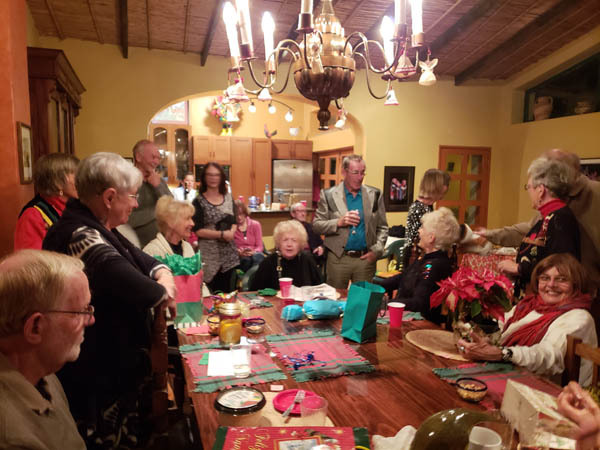 Chuck and Jean hosted their annual Christmas Eve party, which included singing Christmas carols and opening white elephant exchange gifts. 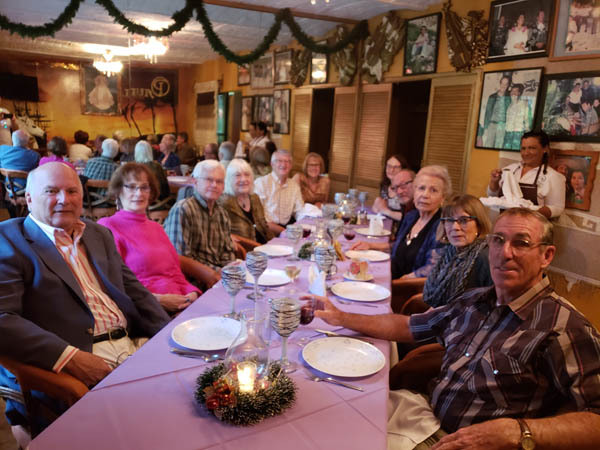 Christmas Day was spent at Armando's, a cozy little restaurant on the back streets of Ajijic. It came with turkey and all the dressing. 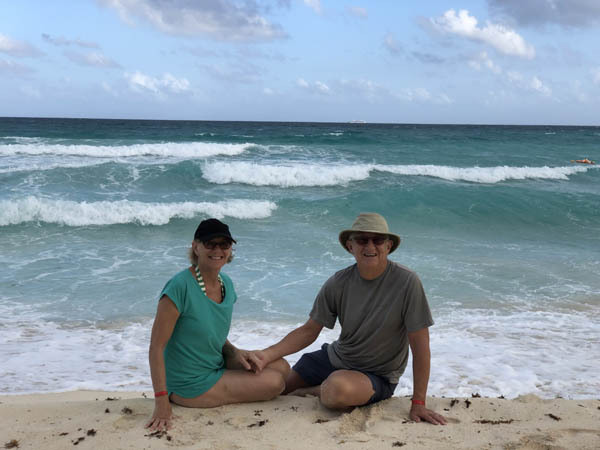 On December 27, we flew to Cancun to spend a week at the Crown Paradise Club Resort, an all-inclusive resort where none of us had to cook or do dishes. By the 28th, everyone had arrived and were ready to start celebrating the holidays. Our grandchildren were so excited to see each other. 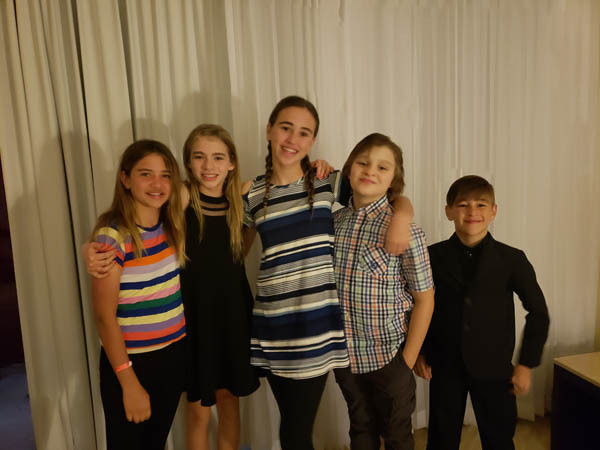 My, how they've grown. We sent Carmen the picture of us cutting the cake and she surprise us with t-shirts made up for us. 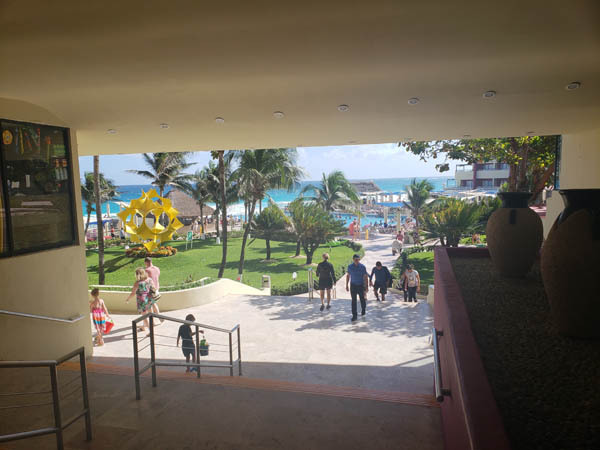 As we walked through the resort, dozens of people stopped to congratulate us. 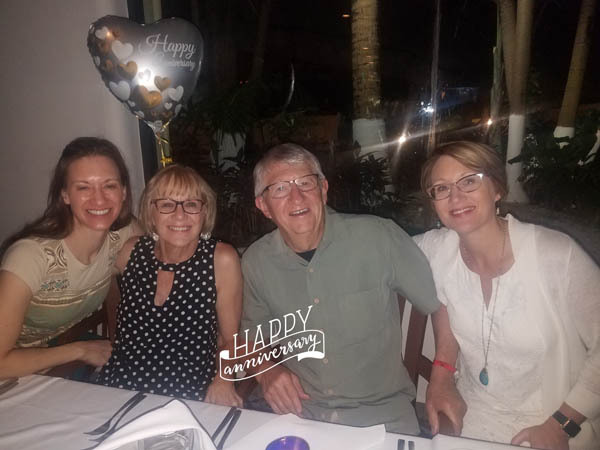 The evening had arrived and here we are celebrating 50 years of marriage with our daughters Denise and Carmen. This would be one of many peak moments from our week together. Grandma Glorine is helping the boy transform themselves into Mermaids. It only worked while they remained still in the sand. 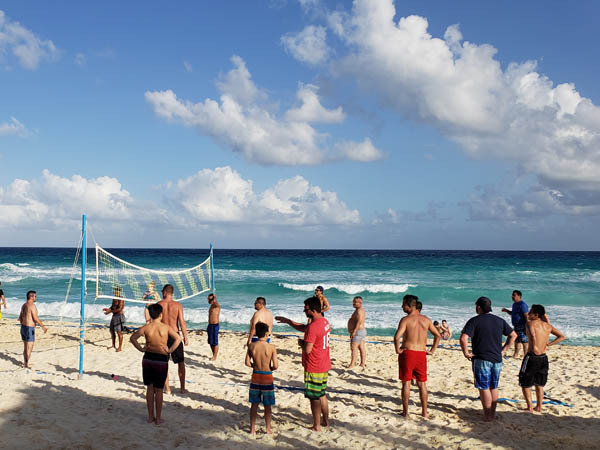 Beach volleyball was one of several popular activities going on at the resort. 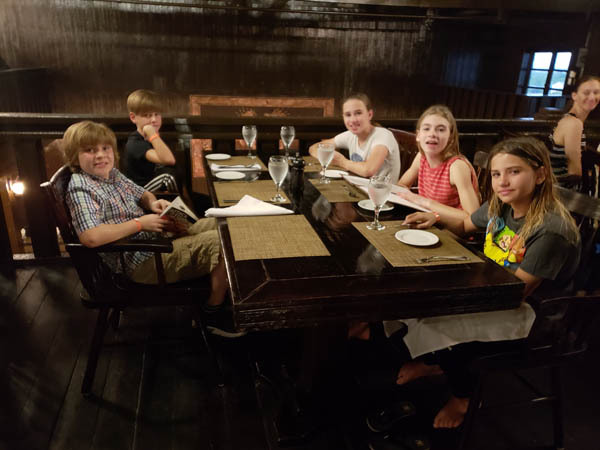 The kids had the run of the resort and spent time at the kids club. 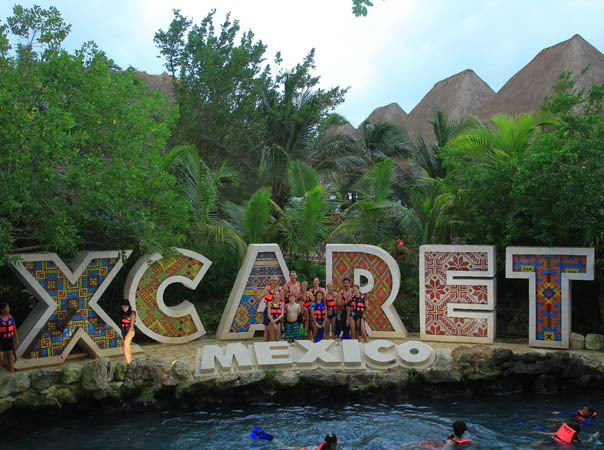 Our first day trip took us to XCaret, a private theme park that went all-out to create eco-tourism that captures the essence of Mexico. 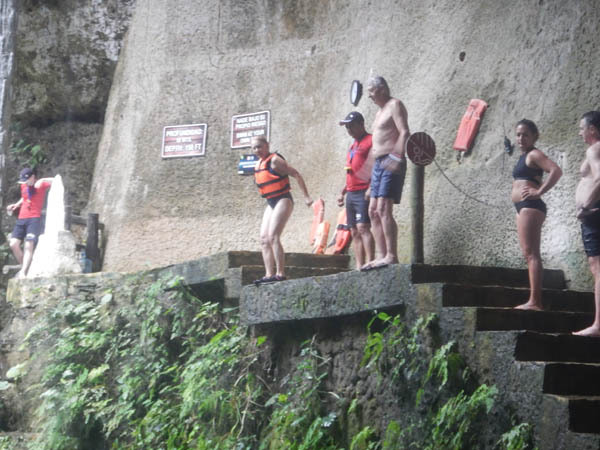 Our first activity was floating 1-1/2 hours in this underground river. Cameras were situated throughout the river to allow us to capture the excitement. The river ran into the ocean, where they delivered our clothes, posed for more pictures and time for a grand buffet, which we needed for our hike back to the entrance. 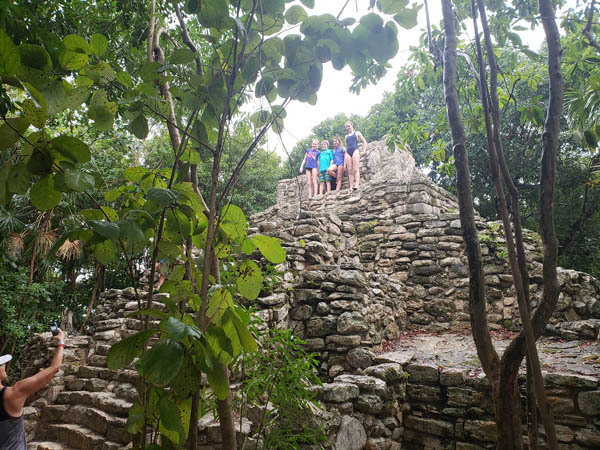 On the way back the kids got to climb this Mayan ruin, dating back to the early 1400s and said to be one of 4,400 ruins spread through Mexico and Central America. 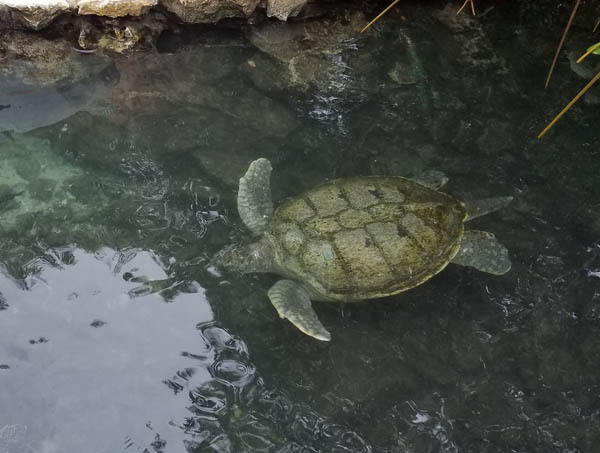 The park had extensive collection of species including butterflies, deer and other wildlife, tropical birds, anteaters, and sea turtles--from hatching eggs to this monster. 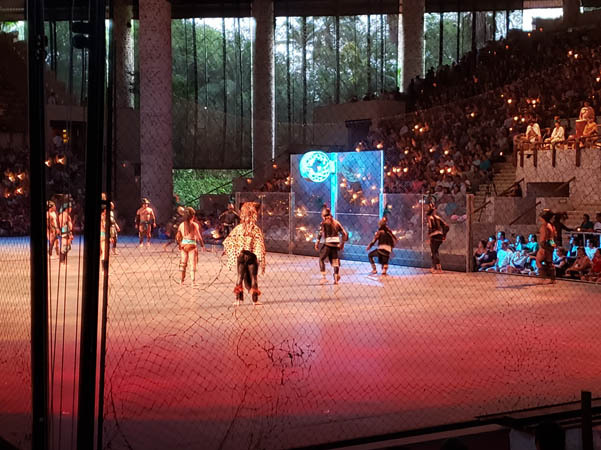 Carmen and Denise got these front row dinner seats for the evening entertainment, starting with ancient Mayans playing a ballgame by putting a rubber ball through a stone hoop without using their hands. 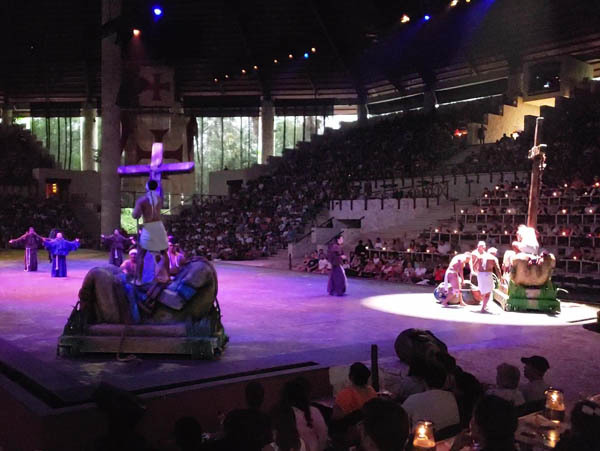 It took the conquistadors awhile to conquered the Mayans, but when they did they destroyed their temples and sacred sites and installed Catholicism as the religion throughout the country. 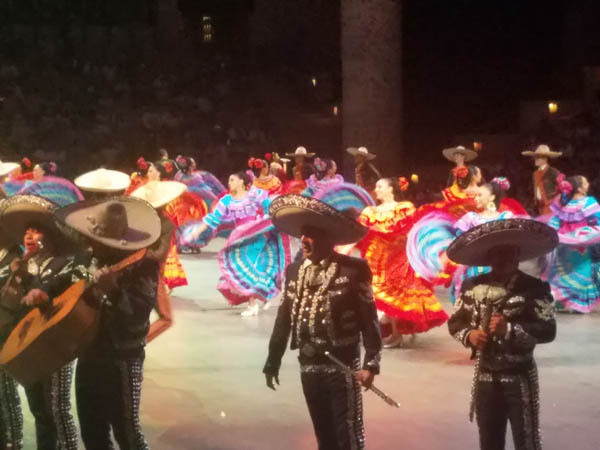 The Mariachi players and Folkloric Dancers were the last entertainment of the evening and the crowd got into it by clapping and singing to the Mexican ballads. 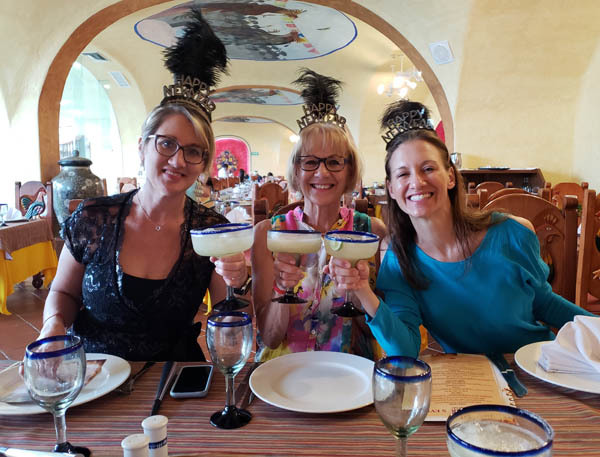 Time to celebrate New Year's Eve and where better than a Mexican restaurant and Margaritas!! This would be the beginning of many more. Cheers all around! We made dinner reservations for 5:30 which gave us lots of time to enjoy the countdown till midnight. 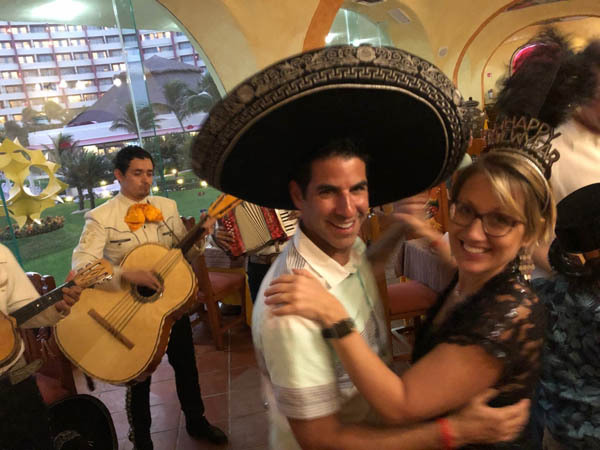 We changed the character of the restaurant when the Mariachi Band started playing, first with dancing then Glorine started a Congo line snaking through the restaurant. 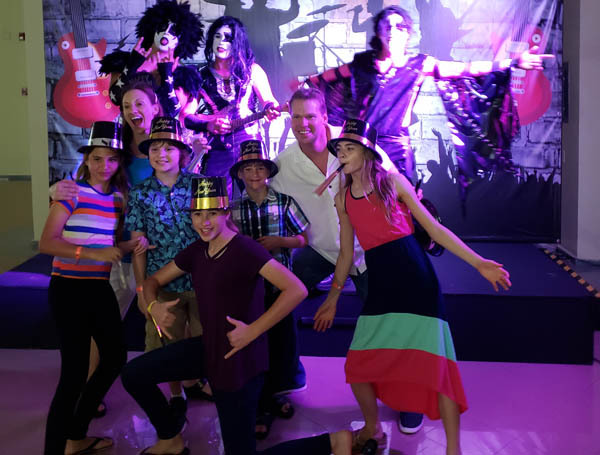 When we arrived at the evenings entertainment, dressed up version of KISS, the rock band of the 70s and 80s, greeted us with load music and more Margaritas. The kids loved posing with the band. 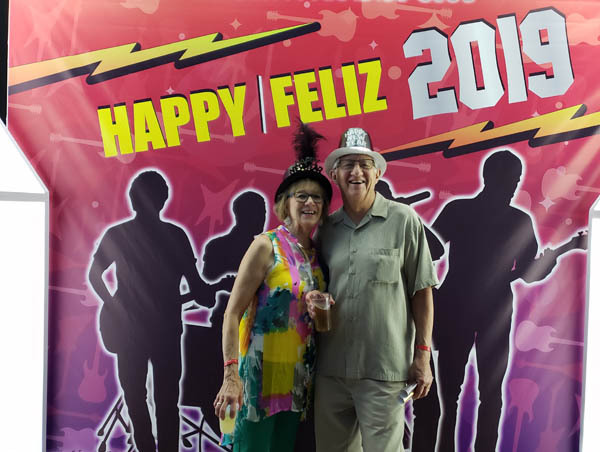 Grandma and Grandpa were getting into the mood of shedding the old year and ringing in another exciting New Year! All-inclusive meant all inclusive. 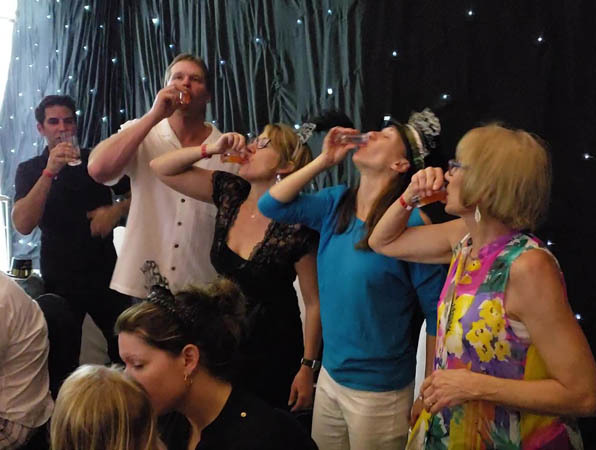 The booze and music flowed past midnight and we danced to some good old rock and roll that all three generations loved. 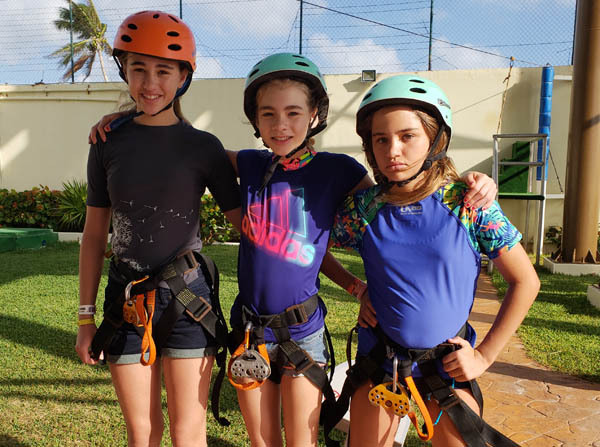 The resort had zip-lining, rock-climbing and giant water slides, which the kids took advantage of throughout our stay at the resort. 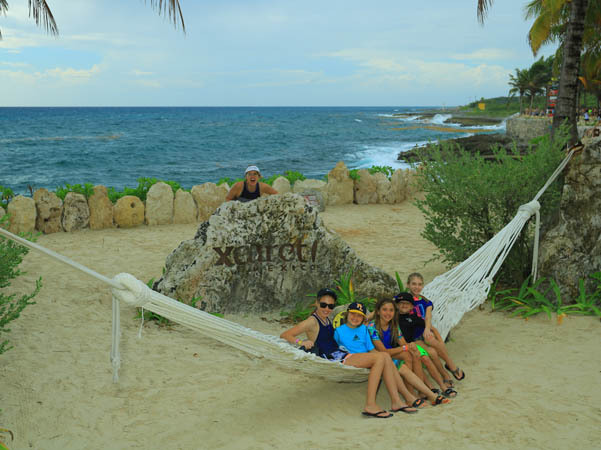 We staked out this spot as our "hang out" during the days we stayed at the resort and played games, told stories, went swimming, played volleyball and napped. 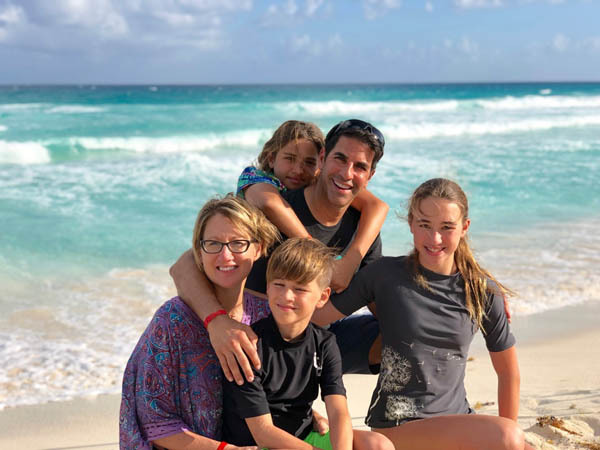 Mike and Carmen got married 15 years ago about an hour south of here, in Playa del Carmen. 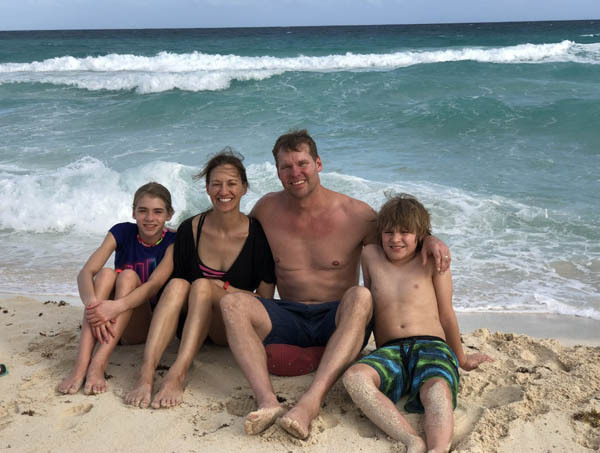 Craig, Denise and kids are hardy Minnesotans, but are truly enjoying the sun and warmth of 80+ degrees. Most days were partly sunny, but the wind was pretty constant, which kept most us close to shore. 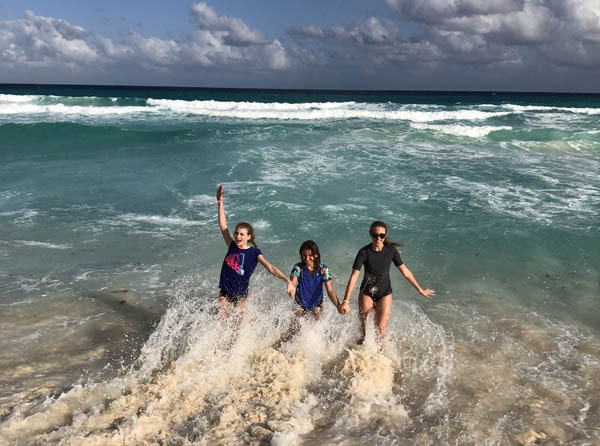 The girls love playing in the ocean, even though RED flags were out during most of our stay. 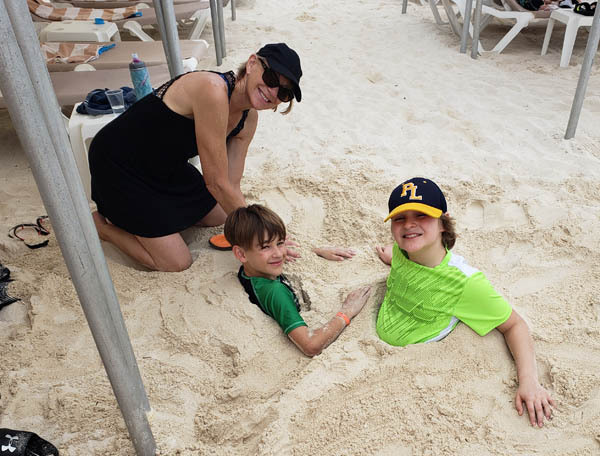 We filled four days at the resort with time at the beach playing in the sand, in the ocean or taking advantage of all the activities the resort had to offer. 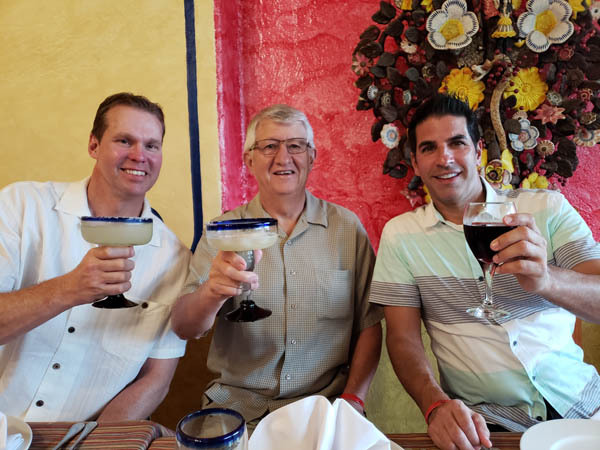 The resort had five restaurants--Mexican, Italian, French, Fishermen's, and Steakhouse. With five of us being vegetarians, they all had menus to meet our needs. 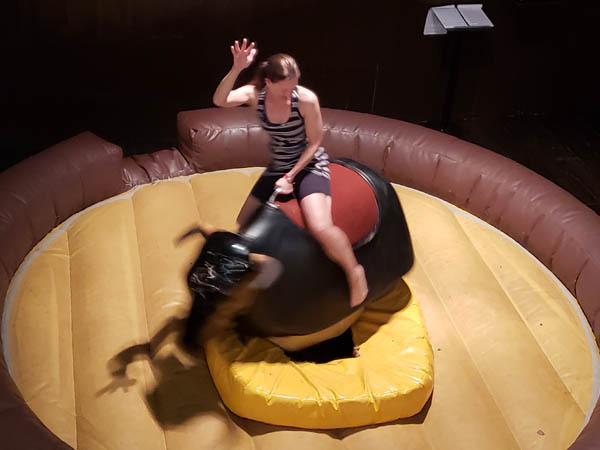 The western theme steakhouse, came with its own mechanical bull, which Denise and Craig each took a turn riding. 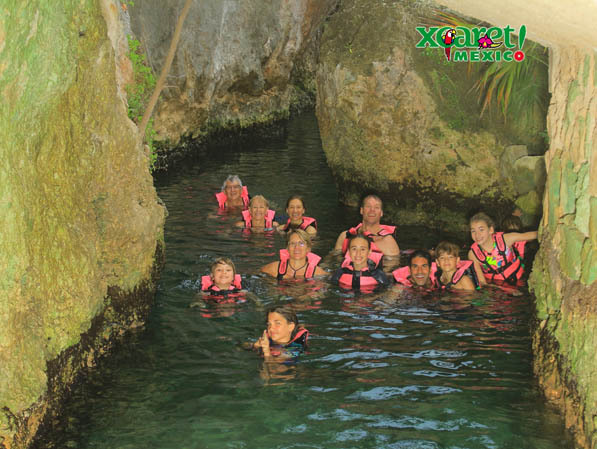 Our last day together was a day tour through Mayan country. 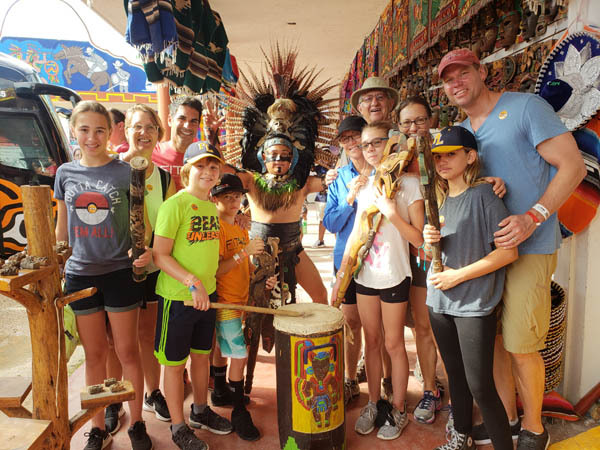 Our first stop was at a Mayan village (including a gift shop) where we posed for this picture. 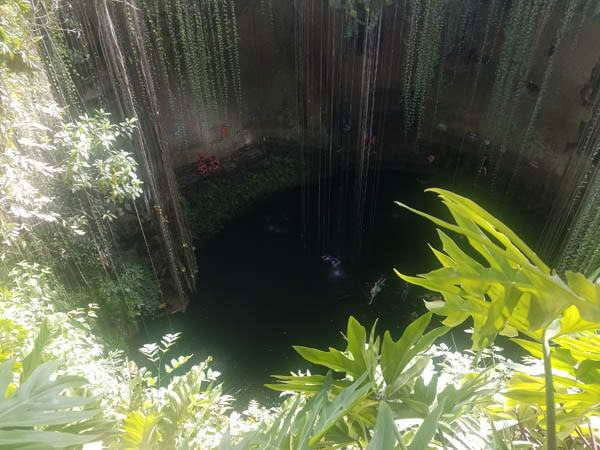 Then on to a Cenote (pronounced cen-oh-tay), which is a deep sinkhole of collapsed limestone unique to the Yucatan Peninsula of Mexico. 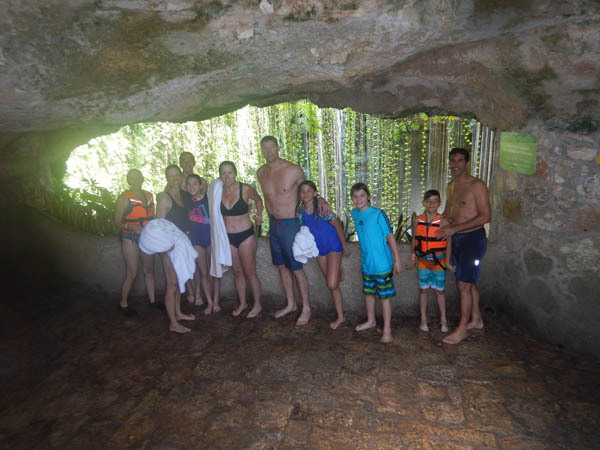 Equipped with our swimming suits and towels, we posed for this picture in front of what looked like a picture window into the natural pit. 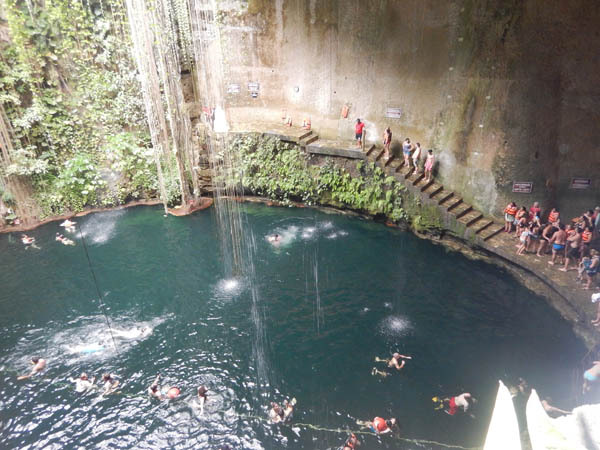 Dozens of people were jumping into and swimming in the cool waters at the bottom of the sinkhole, which are interconnected as underground rivers. We each took our turn jumping 15-20 feet from this platform into the "cold" water. With the humid air, it was a refreshing dip. 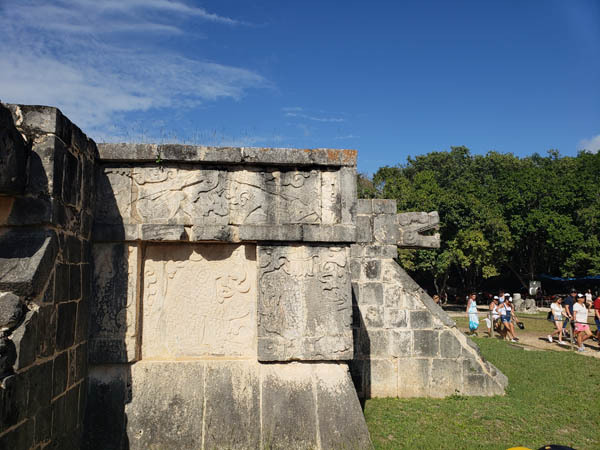 After a quick lunch we were off to our final destination of the day, which is the pre-Hispanic city of Chichen-Itza. Each stairway has 91 steps--time four sides equals 364, one for each day of the year. Coincidences?? The city dates back to 600 AD and was built over centuries. Each of the pictures on this building are a part of their alphabet--telling stories of their history and culture. 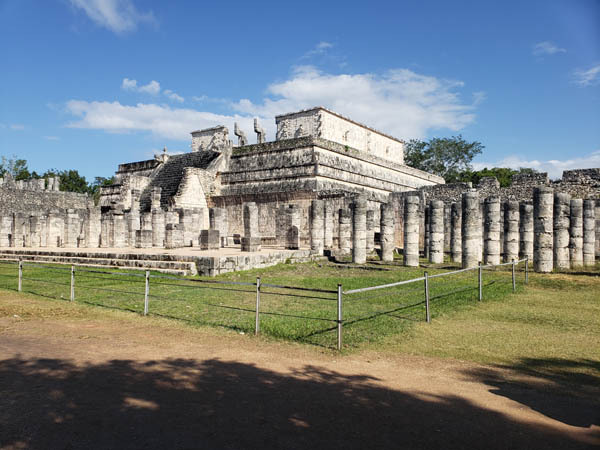 This is the Great Temple of the Warriors built in 950 AD with over 200 square and circular columns. 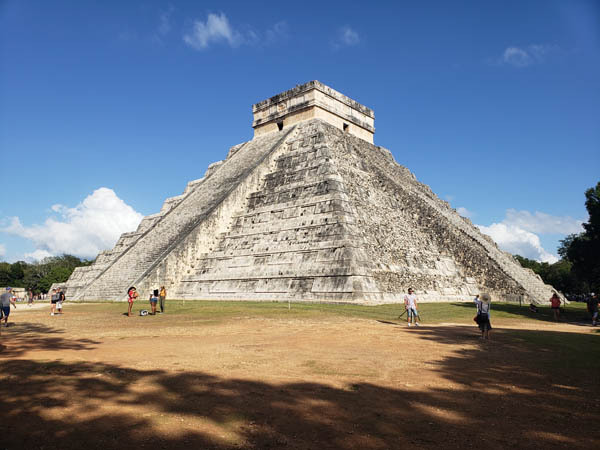 While conquered in 1542, over 6 million Mayans still live in Mexico and throughout Central America. 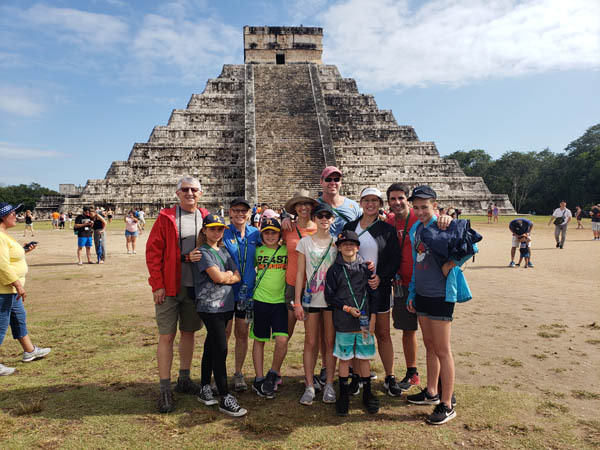 We had a couple of rain showers while we toured Chichen Itza, but that did not stop us from taking one final photo op with the pyramid in the background. The next day we said our farewells till our next adventure together.